Let’s face it, it’s hard to separate truth from legend. Shaolin monks appear to be part of a miraculous world, a world where everything is possible and human limits are exceeded at every turn. 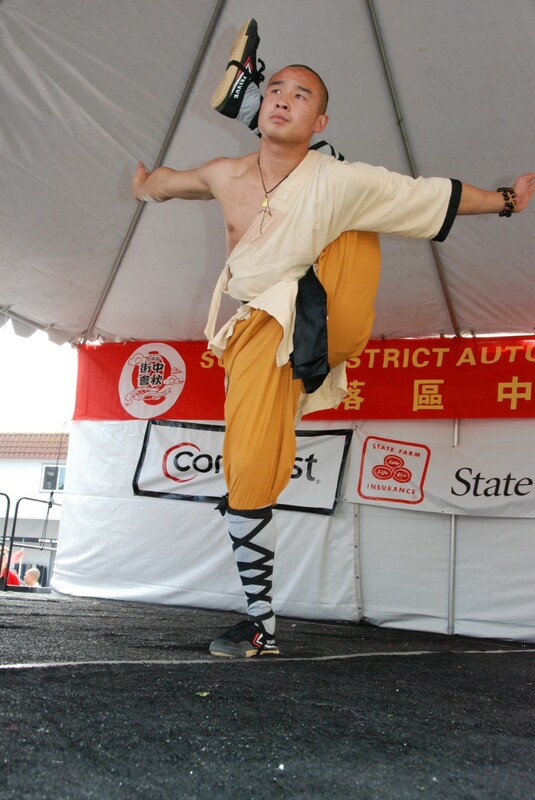 Yet, what does being a Shaolin monk mean? Can every ordinary person make those amazing moves? Do they take some magic dust, something cooler than your multivitamins? Or is it only a result of special effects for the show? It’s not like in the movies, but these people really reach some impressive performances. Let’s see take a quick look at what their lives are like! 10 How can you step on the Shaolin monks path? Who founded the Shaolin Temple? What religion do Shaolin monks have? The Shaolin Temple is one of the most popular sites in China. And I do not speak only for tourists. It’s a true spiritual center. 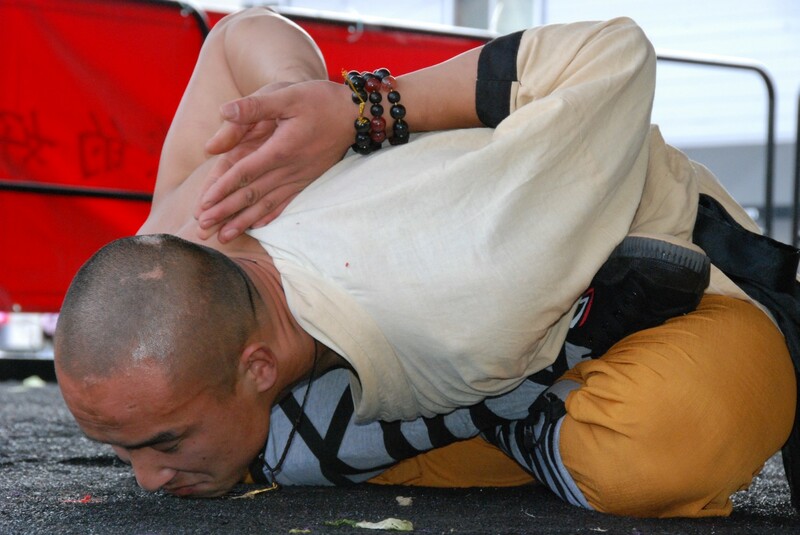 If you ask what is the starting age of Shaolin practice, you will be surprised to learn that it is possible even at the age of 3 1)”Inside the Life of a Shaolin Monk” – interview by Stacey Nemour with Sifu Wang Bo! It seems difficult to understand how a child can become a monk. But you can consider it as a special school. While living in the temple, “learners” undertake to respect the rules of the place. Strict monastery rules. But no one is compelled to live there for life. You can leave anytime. In fact, most just leave when they want to take life in their own hands. They retain the status of monk who doesn’t live in the temple, but it’s more of an honorary title. Like a graduate title, somehow. The restrictions are not the same – they may even marry 2)”Inside the Life of a Shaolin Monk” – interview by Stacey Nemour with Sifu Wang Bo. But the age at which they become monks is not important. Some are young, others do it later. They are physically tested – a short test with low relevance. But the true test will be the psychic one. The most important questions are about how they see life. The Master realizes who is suitable for this and who is not 3)”Inside the Life of a Shaolin Monk” – interview by Stacey Nemour with Sifu Wang Bo. Shaolin monks are not born super-humans. They train all their lives in different disciplines. Buddhist meditation, kung-fu, strengths, and gymnastics. All this would not be possible, as in professional sports, without discipline and respect as well as clear rules in nutrition and lifestyle in general. This explains the fact that their training can be sustained every day without breaks. Healthy mind in a healthy body. 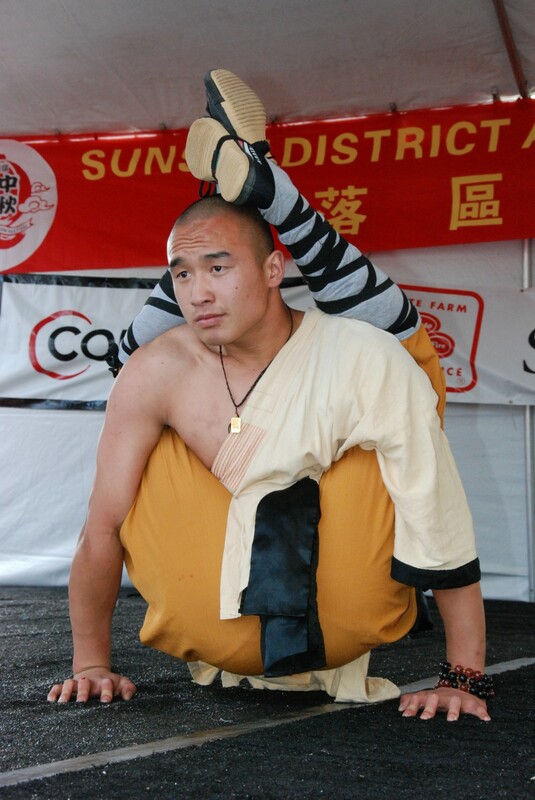 Shaolin monks succeeded with combining both of them. As in Christianity there is a “Prayer of the Heart”, a simple prayer that monks say incessantly repeating over several inhalations and exhalations; the Shaolin monks also practice exercises without interruption. Their days are full of simple exercises that push their body and mind a little bit further. For example, students are urged to punch a stack of paper hanging on a wall. It does not seem like much, but just think that you do that for two hours a day. (If they are bills, it might keep you a bit more motivated.) It’s like river water that shapes the rocks deep on the river bed, with infinite patience. Their hands don’t suffer from this strange exercise, but harden. It was found that we are dealing with a process called “microfracture”. Nowadays, it is done in hospitals, surgically to repair cartilages 4)”Microfracture surgery” in Wikipedia5)”Trabecular microfracture” – study conducted by Fazzalari NL, published in Calcified Tissue International no. 2/1993. But Shaolin monks discovered this technique a long time ago. It is used to strengthen bones and joints. Microfractures are small enough not to harm one’s health, but large enough to stimulate the body to heal and strengthen. This is not, by far, the only exercise to strengthen the body. Another technique is striking a tree with a finger. 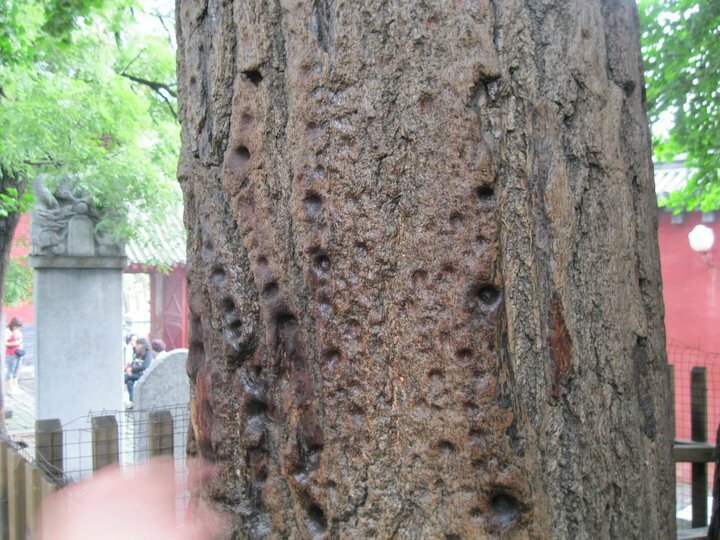 Visitors can see traces in time on such a tree. Such “magical powers” impressed the Western world and were attributed to meditation practiced by Shaolin monks. Some have concluded that the average person practicing this meditation can come to have special powers. How does it translate sati? Buddhists practice what is called sati. The term appears to be difficult to translate, because there is no equivalent that would provide the exact meaning: memory as a form of consciousness (not as a remembrance) 6)”Mind in the Balance: Meditation in Science, Buddhism, and Christianity” by B. Alan Wallace, book published by Columbia University Press in 2014. Is keeping your state of full consciousness. Thomas William Rhys Davids translated the term into English in 1881 7)”Buddhist Suttas” – translated by T.W. Rhys Davids, originally published in 1881, as mindfulness, a word rarely used previously, but has caught meaning with this expression. As neither mindfulness does not translate easily into other languages, some translations have taken it exactly as it sounds. But some Buddhists expressed their hesitance in translation, considering that it doesn’t fully expresses the meaning of sati, distorting its meaning. 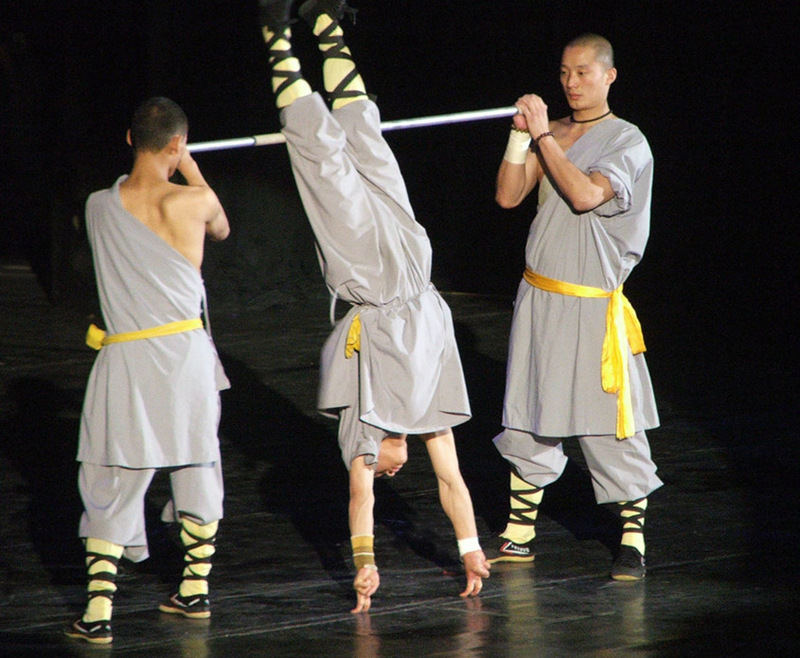 No matter how many legends should appear around them, Shaolin monks are not any occult group. Simply, The Shaolin Temple is the center of Chan Buddhism (called Zen in Japan and elsewhere). Meditation practiced by these monks is called sati and is the same for all Buddhists. Equivalent to a large extent with the vigilance of Christianity, sati meditation is better connected to the present, as we know, based on your becoming. It means your mind shouldn’t run away on grassy planes. It is the ongoing reminder that the mind must be active and attentive to the present 8)”Sati (Buddhism)” in Wikipedia. In this way the mind is cleansed of evil and learns how to be always in a state of alert (which is beneficial and does not tire the body) in which to remove all negative thoughts, emotions of any kind, temptations, and impulses. It thus reached a state of peace, where there is no right and wrong and the student is detached from all, does not judge or condemn the bad things, no longer marvels over great things, but seeks balance. What do you think, can you do things like this? If you think you can sati meditate during your work break and the results will be spectacular, you’re deceiving yourself. It takes a systematic and rigorous approach. You must deeply understand the principles and spend enough time practicing. Do not forget that we’re talking about some monks – people who have dedicated their whole life to Buddhism and who live by the rules of the temple. However, for the modern man, meditation systems appeared, inspired by Buddhism, easier to understand and apply. Perhaps the results will not reach the same level, but certainly bring health benefits. Learning to master your mind, you get to control your negative moods that can induce health problems 9)”Prospective study of phobic anxiety and risk of coronary heart disease in men” – study conducted by I. Kawachi, G.A. Colditz, A. Ascherio, E.B. Rimm, E. Giovannucci, M.J. Stampfer and W.C. Willett, published in Circulation in 1994, you can even control certain health conditions, such as allergies 10)”The rubber hand illusion increases histamine reactivity in the real arm” – study conducted by N. Barnsley, J.H. McAuley, R. Mohan, A. Dey, P. Thomas and G.L. Moseleyemail, published in Current Biology on December 6, 2011. Shaolin monks believe this meditation is the cornerstone of their abilities. They say that after a long time of practice you become aware of everything happening around you and you can react extremely quick. A quality irreplaceable in battle. But for this, there’s something more you have to do. I showed you how meditation develops extremely fast reflexes, but what do you do when you feel an arrow flying towards you, but your muscles are weak from too much beer, belly is too heavy from the fried meat, and bones stuck from the 12 hours you spent playing kung-fu games on the console? Well, take it from me, you’ll try to avoid the arrow, but often you will do so after you get struck, or you’ll break your spine when jumping. So I recommend a bit more physical training. 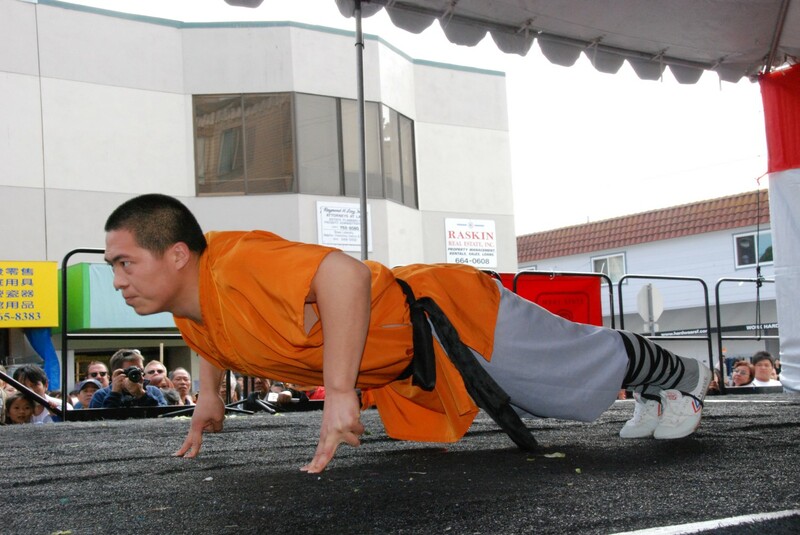 Shaolin monks probably practice the most intense workout on Earth. As I said, the training is done almost without stopping. Time is not wasted, but there is no excessive workout. They’re looking for agility, muscle flexibility, and short reaction time. Muscle strength is needed for hitting, but the body is also trained to face blows. Everything you saw in movies with Bruce Lee and Jet Li cannot be obtained without a rock-hard body. Physical resistance is developed through obstacle courses; martial art skills are acquired in combat with one or more partners. Many of these techniques are a secret. Many of them have “refreshed” through movies or individuals who witnessed or participated in similar training. So, in places other than China, many schools of martial arts appeared attempting to give students the feeling they are very close to what is practiced in the temple. Even if you get some results, the difference is huge. To be a Shaolin monk, you should train in the Shaolin Temple. There you will receive the original training. There yet remains a reality: these special people can do two-finger push-ups. Or unimaginable contortions. And the speed with which they move is enviable. Among those listed above there is some correlation, registered by Shaolin monks since ancient times. Children, along with wildlife, have freedom of movement and outstanding flexibility. Not to mention their energy that seems “inexhaustible”. Each monk chooses which animals they are, studying their movements and then specialize their fighting style accordingly 13)”Inside the Life of a Shaolin Monk” – interview by Stacey Nemour with Sifu Wang Bo. You saw some styles in movies, like the tiger, the snake, the crane, etc. One of the techniques used by Shaolin monks is called Qigong. Its important parts are breathing exercises and body movements. It’s a kind of gymnastics, which certainly you have seen some people practicing in parks. “Qigong” (also spelled “Chi Kung”) means “vital energy cultivation” 14)”Bodymind Healing Psychotherapy: Ancient Pathways to Modern Health” by Michael Mayer, Ph.D., book published by Bodymind Healing Publications in 2007. 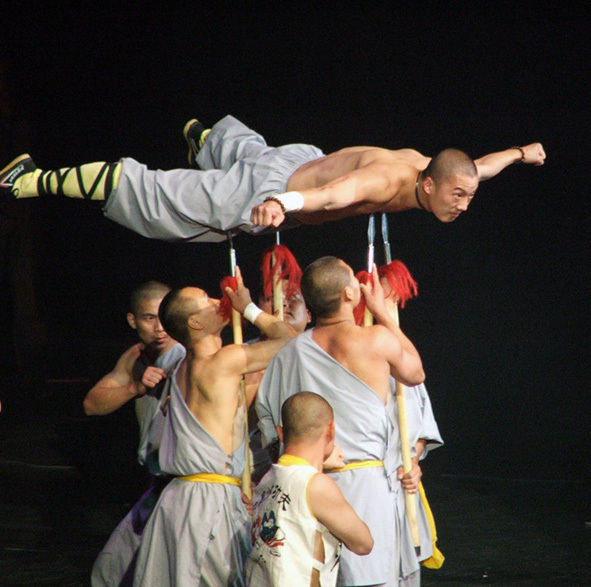 Shaolin monks argue that such energy is everywhere in nature. It’s up to us to learn how to use it. Until then, the position of a tired man, unbalanced and with bad habits, being great energy consumers, he will look at Shaolin techniques as something magical. But there’s nothing magical. It’s just mental and physical control pushed to perfection. One of the Buddhist precepts is that a believer must do what he can to not end a life. That led to different interpretations concerning the consumption of meat among Buddhists. Some remain closer to the teachings of Buddha who said that a Buddhist monk can eat meat, provided the animal has not been sacrificed for him. That’s because a Buddhist monk eats what is offered to him, whether he likes it or not. Others argue that since it is not good to sacrifice an animal, it’s also not good to eat its meat. And to the end of his life, it seems that Buddha recommended that plants that have touched meat are to be washed thoroughly before being eaten 15)”Vegetarianism and Animal Ethics in Contemporary Buddhism” by James Stewart, book published by Routledge in 2015. 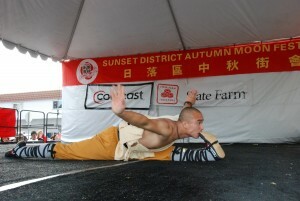 Shaolin monks are vegetarians. Even if, in the seventh century, Emperor Tang Taizong granted them the right to eat meat, as a grateful exemption for their heroic deeds. However, we are talking about some very good athletes. They need a lot of protein for their muscles and the easiest way to obtain this is from a big hunk of steak. But I’m sure you already know: proteins are also found in beans, tofu, milk, and nuts. And the lack of toxins that can be found in meat is of great importance. Their dishes don’t include onions, garlic, or spices that might incite their senses. Although such foods have their benefits, they believe that inner balance – undisturbed by external stimuli – is more important 16)”Shaolin Temple Diet” by Michelle Kerns, article published in Live Strong on June 11, 2015. Breakfast is the most interesting. Usually it consists of a sort of congee (a thick Asian soup). Not just any kind of soup, but one with medical capabilities. It’s called “eight treasures” because it contains eight ingredients very good for health. Masters are convinced that those who consume it daily have a healthier and considerably longer life. Beans are left to soak in water overnight. All nuts and beans are boiled in 500 ml of water, then left for 1 hour over medium heat. Add the millet and rice (preferably brown) and leave it to simmer until very tender and creamy. Add jujubes and hawthorns, possibly a piece of stone sugar (a type of sugar used traditionally in China, but you can use any sweetener – or not) and all is left to cook for 10-15 minutes more. The ingredients may vary depending on the season and opportunities. For example, millet may be replaced by barley, preferably to a lesser extent. Instead of some nuts you can add sunflower seeds. Hawthorns can be replaced by lychee or goji. Awakening. (No alarm clock with snooze button.) Immediately after, one makes incantations outdoors, no matter the weather. If someone dozes, he receives two blows on the shoulder to wake up. And has to be thankful about that. Breakfast. Usually meaning “eight treasures”. Kung-fu training. During training, the fighting style changes every 10 minutes. Lunch. The plate contains several kinds of vegetables, tofu, and rice. They don’t drink liquids during meals. Main break, they can meditate, relax, or take a nap. Break. Before dinner there are no incantations, out of respect for the dead. Dinner is rich in carbohydrates, such as noodles and bread. Bread can be black or white, prepared traditionally. Incantations with the Heart Sutra – Buddhist teaching fundamental text 19)”Heart Sutra” in Wikipedia. Health is top priority. Without health you can not do anything. It’s good to cherish it through regular exercises and a life lived correctly. Lack of commitment is the worst. You need to think carefully before you start work. And when you start, you have to keep it up consistently. Do don’t settle for half measures. Meditation is essential. They do it until they start to eat while meditating or walk while meditating. Their every step is Zen. All this leads to an inner tranquility that can’t be disturbed. Food is the cure. They eat and drink only what and how much they need. Through physical exercise, excess water and food is removed, and the body will naturally require healthy food. Concentration is the key to efficiency. Better choose a 10-minute workout with focus than one hour without focus. Bad habits make our lives harder, and not the surrounding reality. Every time a negative emotion arrives, the Shaolin monk is thankful for it and rejoices that he will get a breakthrough – unlike many of us who cling to it and begin to rotate it in our head, causing us increasingly more harm. A peaceful heart is always present. Try to be quiet every day and refresh your inner peace and peace will always be with you. How can you step on the Shaolin monks path? Shaolin monks have a very interesting philosophy of life. I urge you not to get your luggage to go to the Shaolin Temple. Being a monk is not tailored for everyone. But you can apply some teachings to improve as you feel they suit you best. What to start with? Alex Lecca is an enthusiast of curiosities and misteries, that admires people who surpass their limits.